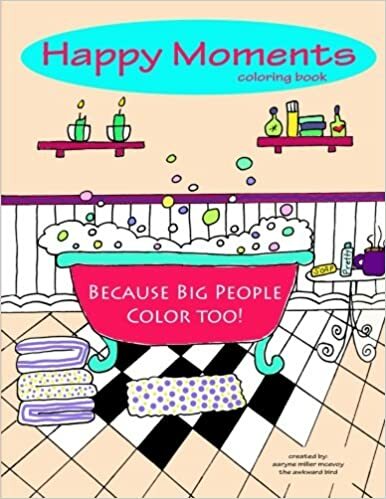 My “Happy Moments” Coloring Book for Big People is now available on Amazon and I am just tickled beyond words. I won’t ruin the story of how this book came to be (for those who love coloring books for grown-ups and just might add this to their list of needs this year), because I included it in my book, but it has been a project in the making for the last two years. Toward the end of October I realized that I was really close to being finished and if I buckled down, I just might have it ready for your holiday gift-giving moments this season. It’s no secret that I love looking for unique gifts and that I like things that are not what you see everywhere. I created this coloring book because I was not really all that interested in the images that were in the books currently on the market. The Taste of Home Coloring Books are really the only books I have found that have coloring pages that I like. I love happy pictures that make me feel like I am coloring a moment and food. And I do not like too much detail. It’s an attention span thing. So, being the dreamer and all that I am, two years ago I decided to start making drawings that I liked and see where it would take me. And today, I present to you a really fun different style of coloring book for big people that will make a great gift, especially when you add in some pointy new crayons or colored pencils. It’s currently available on Amazon, but will eventually be available on Barnes and Noble.com. That works out nicely for me because I have free shipping with Barnes and Noble from being a member subscriber. But…as an FYI, I just ordered a few of my own coloring books from Amazon (and I will have to be careful doing that too often!) and there is currently free shipping over $25 dollars. I have already completed most of my holiday shopping for my giftees, but I did need to pick up a few books for my mom, my grandmas and a special friend that this book is dedicated to. His journey started mine and he definitely needs a copy of his very own. Thanks for being a part of my journey and I would love to hear what you think. A gal needs her BFF’s to give it to her straight ya know!